renaming a single file could be no difficult task as anyone could do that by just right clicking on the file and then from the rename option from the list menu simply put up another name for that file but what if you have to rename multiple files means more than 10 then this could be the real time consuming task. You would get broken if the number of files is huge and it might also happen that you could take up the whole day long to rename the number of files in windows now no one would have ever thought of the thing of renaming the whole batch files all at once because this feature could feel impossible and is also not there in the default windows options although this thing could feel impossible to let you know about that this is totally possible and the multiple files or the batch files could be easily renamed all at once forgetting that feature enabled in the windows there has to be a method followed by the users here in this article we have written that particular method. Batch file to rename multiple files batch file to rename multiple files advanced renamer is a program for renaming multiple files and folders at once by configuring renaming methods the names can be manipulated in various ways with advanced renamer you can construct new file names by adding removing, replacing changing case or giving the file a brand new name based on known information about the file if you want to set up a batch job to rename multiple files on your windows computer advanced renamer could be the best choice for you. windows 10 computer the best thing about bulk rename utility is that it allows users to rename multiple files at once without the need of command prompt the interface of bulk rename utility looks complicated but its super easy to use just select the files that you want to rename and then change the options in one or more of the many available panels batch rename multiple files the utility shows you the preview of the file in real time so if you like the output name then you can click on the rename option the app is really very fast and it can rename tons of files in no time. Siren is another best and advanced batch rename tool that you can use right now the most notable thing about siren is its ability to use the information from file properties to rename the files accordingly that means you can add custom batch action on an extension basis the features of siren doesn’t end here as it also has support for command line interface how to rename multiple files at once with different names how to rename multiple files at once with different names however the tool is a little bit difficult to understand due to a wide range of features however with time you will be able to master the bulk rename utility so the siren is another best bulk rename tool that you can use on your windows 10 computer so this was the method through which you could easily rename your multiple batch files while using the windows on the computer as from the article you have got up that the method isn’t too difficult or complex but any moderate user could apply it without any issues it’s now your time to apply this method to your batch files in windows and hence rename them all at once easily. Step 1. First of all select all those bunches of files which all you wish to rename note that by the method your files would get up the much similar type of names although could be differentiated easily if you wish to go with that, then this method could prove to be beneficial because through this you could easily rename all the selected file at the once. Step 2. After selecting the files just choose the renaming option from the windows explorer you could also press up the F2 button for that if you are using some other kind of file browser in which this command is missing after that you would notice that all the selected files remain selected while the first one of these all gets its name highlighted to be renamed batch rename files in windows Batch rename files in windows. Step 3. Type in the new name for the file that is highlighted and then presses the enter button you would see that all your rest of the selected files will automatically get renamed using the name you have used for the highlighted file the only difference between the alter files would be the numerical extension text added to all the files that all would be completely different from each other. 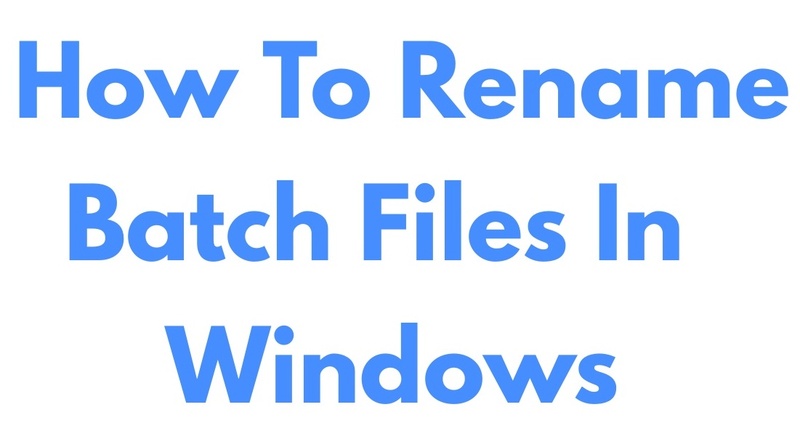 To rename the files using the command prompt just try to use the command run file name my name you could use the with the file names to match the similar kind of file names and hence rename these all at once batch renamefiles in windows batch rename files in windows for eg. run txt.html and all the files would get their extension changed from txt to HTML.